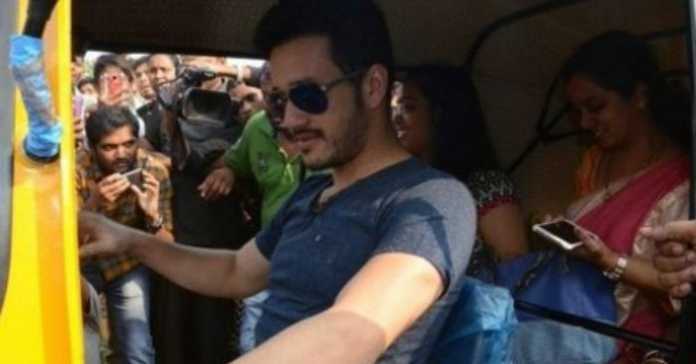 Now its time Actor Akkineni Akhil turn has fulfilled the wish of his fan named Ashwith Reddy, As per the latest reports, Actor Akkineni Akhil Turn As Auto Driver to fulfilled the wish of his fan by visiting him personally at Khammam District. Going to details the young fan of Actor Akkineni Akhil named Ashwith Reddy has been suffering from kidney ailment for some time. Akhil Akkineni got to know this news and went to Khammam District to meet Aswith Reddy. He also drives the auto to get some money. Actor Akkineni Akhil Turn As Auto Driver and earned almost Rs 3000 rupees by auto ride, and that money has been donated to Ashwith Reddy family. Akhil Akkineni also spent some time with Ashwith family and wished him for a speedy recovery. Ashwith family overjoyed with Akhil’s gesture. Not only Akkineni Akhil several Telugu Actors like Pawan Kalyan, Ramcharan, NTR, Mahesh, Allu Arjun, and Nandamuri Balakrishna have also made time to meet fans who are fulfilling their wish.